In our post about Fatma Begum, India’s first woman film director, we had mentioned Ardeshir Irani as the father of Indian talkie films, as he was involved with the making of both “Alam Ara” (the first Indian talkie) and “Kalidas” (the first Tamil talkie), both of which were released in 1931. In fact, “Kalidas” was made on the sets of “Alam Ara” by Ardeshir Irani’s former assistant HM Reddy. The ‘indigenously-made’ tag comes into play thanks to other experiments with colour by pioneer V Shantaram, who co-founded the Prabhat Film Company. 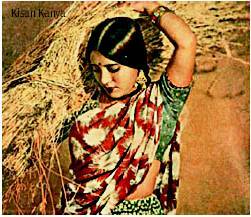 In 1933, he produced a Marathi film titled “Sairandhri,” which had some scenes shot in colour. But in the case of “Sairandhri,” the film was printed and processed in Germany, thereby allowing “Kisan Kanya” to be remembered as the first indigenously-made feature film in Hindi. “Kisan Kanya” is said to have had a run time of 137 minutes and its cast is reported to include actors such as Padmadevi, Jillo, Ghulam Mohammed, Nissar, Syed Ahmed, and Gani.